There’s no more fitting way to end the Thanksgiving holiday than by adding one more night of festivities, Monday November 28. At Lincoln Square’s Winter’s Eve, you can eat your way through an international line-up of restaurants and enjoy some free entertainment and lots of good holiday energy. And, you can be charitable as well. This year marks the 12th annual occurrence of Winter’s Eve at the Lincoln Square Business Improvement District, sponsored by Time Warner. 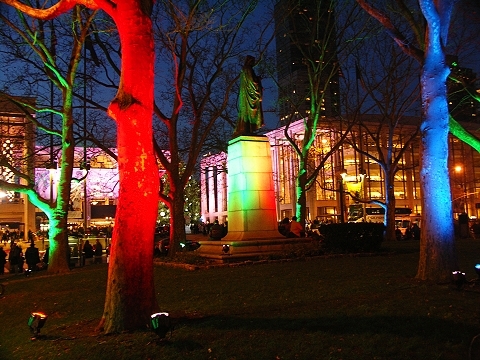 The night will begin at 5:30pm with a performance by Arlo Guthrie and the Newark Boys Chorus, followed by the Upper West Side traditional neighborhood tree lighting ceremony at Dante Park (Broadway & 63rd St). Events will continue throughout the night along Broadway from the Time Warner Center to 68th St. The best of all musical genres will be featured throughout the night, from performances by Big Apple Circus and various school groups including the LaGuardia High School Show Choir at the Time Warner Center, jazz artist Catherine Russell at the American Folk Art Museum, and rhythm and blues bassist Christian McBride at the West Side Apple Store. Be sure to check out the live ice sculpting by the father-son design team of Okamoto Studio in front of the Time Warner Center on at Columbus Circle. One of the best parts of the night, as NYC foodies will agree, is the signature dish samplings of Lincoln Square’s favorite restaurants, with dishes priced from only $1 to $5 each. The stellar line-up includes A Voce, Bar Masa, Ed’s Chowder House, Francesco’s Pizzeria & Restaurant, La Boite en Bois, Luce Restaurant & Enoteca, Magnolia Bakery, P.J. Clarke’s and others. Tastings will also be held in front of the Time Warner Center at Columbus Circle from 6-8:30pm. Some of the activities throughout the evening, catering to both children and adults, include Arts & Crafts with the Big Apple Circus on the 2nd floor of the Time Warner Center, a World Dance presentation by Dance Parade, Inc, and free admission to The American Folk Art Museum’s 9/11 National Tribute Quilt & Super Star exhibition. Most Lincoln Square retailers, including all stores at the Time Warner Center and many on Broadway, will remain open late for the night, offering special values and holiday features for this Monday evening only (much better than Black Friday or Cyber Monday). New York Cares Coat Drive asks you to bring any new or used coats to the event. The annual coat drive is in particular need of children’s coats and large men’s coats this season. All in all, this is a great way to extend one holiday and bring in another. 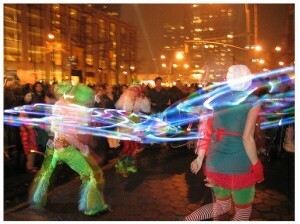 For more information and entertainment listings check out: www.winterseve.org or call 212.581.3774. This entry was posted on Monday, November 28th, 2011 at 3:15 am	and is filed under Stuff to Do. You can follow any responses to this entry through the RSS 2.0 feed. You can leave a response, or trackback from your own site.